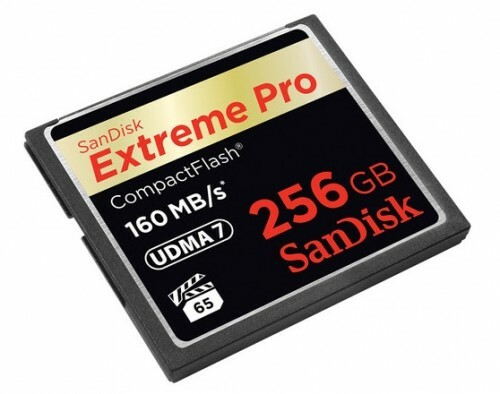 SanDisk has released a new 256GB Extreme Pro CF card with minimum sustained write speeds of 65MB/s and max write speeds up to 140MB/s. Read speeds max out at 160MB/s. The cards are UDMA Mode 7 compliant for fast buffer clearance on supported cameras. SanDisk touts the new high-capacity card as optimized for 4K video capture, which is further highlighted by the VPG-65 specification (i.e., min. sustained write speed of 65MB/s). In addition to the new 256GB Extreme Pro CF card, SanDisk is also upping the read/write speeds in other card capacities. The SanDisk Extreme Pro CF cards in capacities of 16GB, 32GB, 64GB and 128GB will now feature read speeds of up to 160MB/s and write speeds of up to 150MB/s, as well as the same VPG-65 specification. The new 256GB Extreme Pro cards should be available in October for $989.95. Check it out here at B&H Photo. The new 16GB Extreme Pro card runs $79.95 and is available now. The new 32GB Extreme Pro card runs $134.95 and is available now. The new 64GB Extreme Pro card runs $299.99 and is available now. The new 128GB Extreme Pro card runs $649.95 and is available now. Wow…those prices! You are better off getting a Ninja, taking HDMI out of your camera, and getting an SSD which have 3x those speeds and you can get 256GB for less than $300. That’s what I would do shooting 4K on the Canon 1Dc for example. starting to really push the “reality” envelope for claimed performance. Well….. In 2003, I bought a Nikon D100 for $2300. I also bought 2 IBM Microdrives – 1gb each for $500 each. Slow and capable of 119 images. If you dropped one, it was toast. $1000 for 256gb, looks like a deal to me. Look at P2 cards for Panasonic video cameras. Or SAS cards for Sony pro video cameras. All more expensive per GB. Pro media for video cameras has always been expensive. What you see here is absolutely cheap, fast and almost indestructible.